Bernard Eugene Cox, 81, passed away September 2, 2016 at Prairie Elder Homes in Overland Park. Mass of Christian Burial will be 11:00 am Thursday, September 8, 2016 at Divine Mercy Catholic Church, 555 W Main, Gardner, KS. Burial will follow at 1:00 pm at the Ascension Shrine section of Resurrection Cemetery, Lenexa, KS. Visitation will begin at 10:00 am before the service at the church. Memorial Contributions may be made to the Divine Mercy Building Fund. Arrangements: Bruce Funeral Home, Gardner, KS 913-856-7111. Bernard was born October 20, 1934 in LaCygne, KS to Ruth F. (Worlein) and John Eugene Cox. He grew up in Paola and was a 1952 graduate of Paola High School. He served in the National Guard. Bernard married Agnes Mary Curtis on November 12, 1955 in Paola, KS. They moved to Spring Hill in 1969. He retired from his position of Cost Engineer for Bendix in KCMO. He also farmed and raised cattle. He was continuously tinkering. 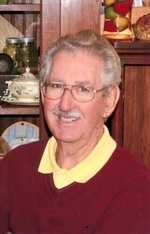 Bernard enjoyed hunting, playing golf, and mushroom hunting, as well as antique cars. He was a charter member of the Knights of Columbus. He will be dearly missed. He was preceded in death by his parents, daughter Jeanine, and brother Kenneth Cox. Bernard is survived by his wife Agnes; children: Jana Youngman and David of Olathe, Jon Cox of Spring Hill, James Cox and Shirley of Gardner, and Judy Nelson and Ron of Hernando, MS; grandchildren: Justin, Derek, Tylor, Colten, Abby, Cooper, Jennifer and Jamie; and one great grandson, Thomas A.